The Royal Exchange in London was founded in the 16th century by the merchant Thomas Gresham on the suggestion of his factor Richard Clough to act as a centre of commerce for the City of London. The site was provided by the City of London Corporation and the Worshipful Company of Mercers, who still jointly own the freehold. It is trapezoidal in shape and is flanked by Cornhill and Threadneedle Street, which converge at Bank junction in the heart of the City. The building's original design was inspired by a bourse Gresham had seen in Antwerp and was Britain's first specialist commercial building. It has twice been destroyed by fire and subsequently rebuilt. The present building was designed by William Tite in the 1840s. The site was notably occupied by the Lloyd's insurance market for nearly 150 years. Today the Royal Exchange contains a Courtyard Grand Cafe, Threadneedle Cocktail Bar, Sauterelle Restaurant, luxury shops, and offices. Traditionally, the steps of the Royal Exchange is the place where certain royal proclamations (such as the dissolution of parliament) are read out by either a herald or a crier. Following the death or abdication of a monarch and the confirmation of the next monarch's accession to the throne by the Accession Council, the Royal Exchange Building is one of the locations where a herald proclaims the new monarch's reign to the public. Richard Clough initially suggested building the exchange in 1562, and oversaw the importing of some of the materials from Antwerp: stone, slate, wainscot and glass, for which he paid thousands of pounds himself. The Royal Exchange was officially opened on 23 January 1571 by Queen Elizabeth I who awarded the building its royal title and a licence to sell alcohol. Only the exchange of goods took place until the 17th century. Stockbrokers were not allowed into the Royal Exchange because of their rude manners, hence they had to operate from other establishments in the vicinity, such as Jonathan's Coffee-House. Gresham's original building was destroyed in the Great Fire of London in 1666. A second complex was built on the site, designed by Edward Jarman and opened in 1669, but that also burned down, on 10 January 1838. It had been used by the Lloyd's insurance market, which was forced to move temporarily to South Sea House following the 1838 fire. The third Royal Exchange building, which still stands today, was designed by William Tite and adheres to the original layout–consisting of a four-sided structure surrounding a central courtyard where merchants and tradesmen could do business. The internal works, designed by Edward I'Anson in 1837, made use of concrete—an early example of this modern construction method. It features pediment sculptures by Richard Westmacott (the younger), and ornamental cast ironwork by Henry Grissell's Regent's Canal Ironworks. It was opened by Queen Victoria on 28 October 1844 though trading did not commence until 1 January 1845. In June 1844, just before the reopening of the Royal Exchange, a statue of Arthur Wellesley, 1st Duke of Wellington, was unveiled outside the building. The bronze used to cast it was sourced from enemy cannons captured during Wellington's continental campaigns. Paul Julius Reuter established the Reuters news agency at No. 1, Royal Exchange Buildings (opposite and to the east of the Royal Exchange) in 1851. It later moved to Fleet Street. The western end of the building consists of a portico of eight Corinthian columns topped by a pediment containing a tympanum with a sculptured frieze by Richard Westmacott (the younger). The central figure represents Commerce, above an inscription from the Bible: "The Earth is the Lord's, and the fulness thereof". The Latin inscription states that the Exchange was founded in the thirteenth year of Queen Elizabeth, and restored in the eighth of Queen Victoria. Two statues stand in niches in the central courtyard. Charles II a copy of 1792 by John Spiller after Grinling Gibbons' statue in the centre of the C17 courtyard, and Queen Elizabeth I by M. L. Watson, 1844. The Charles II statue survived the fire of 1838 that destroyed the previous Exchange. The Elizabeth I statue was commissioned as she was the monarch who had conferred the status "Royal" on the Exchange. From 1892, twenty-four scenes from London's history were painted on the first-floor walls by artists including Sir Frederick Leighton, Sir Frank Brangwyn and Stanhope Forbes. The murals run as a sequence. With the outbreak of the Second World War, trading at the Royal Exchange virtually ended. At the war's end, the building had survived the Blitz, albeit with some near misses. In 1982 the Royal Exchange was in disrepair – particularly the glass roof was in danger of collapse. The newly formed London International Financial Futures Exchange (LIFFE) was the main tenant, using the courtyard for the trading floor, all done without touching the framework of the original building. Other tenants moved in later and as a result of LIFFE's presence, not only did the City experience growth in trading and greater efficiency in pricing, but also a boost to the area around the Royal Exchange that was sleepy at best. In 2001 the Royal Exchange was once again extensively remodelled, this time by architects Aukett Fitzroy Robinson. Reconstruction of the courtyard created new boutiques and restaurants to add to the existing retailers on the perimeter. The Royal Exchange is now a retail centre with shops, cafes and restaurants. The restaurants include Royal Exchange Grand Cafe, Threadneedle Cockatil Bar and Sauterelle Restaurant (http://www.royalexchange-grandcafe.co.uk/). Shops include Boodles, Hermès, Georg Jensen and Tiffany & Co. In 2003 the Grand Café and Bar was launched and completed the building. In Royal Exchange Buildings, a lane by the eastern entrance to the Royal Exchange, stand two statues: one of Paul Julius Reuter who founded his news agency there, and one of George Peabody who founded the Peabody Trust and a business which became J.P. Morgan & Co. In 2013 the Royal Exchange was sold by the Anglo Irish Private Bank to Oxford Properties, a Canadian property company. It had been announced that the site would be sold with a 104-year lease. Oxford Properties Group, a division of the Ontario Municipal Employees Retirement System, bought the retail centre for a reported £86.5 million. ^ [J. W. Burgon Life and Times of Sir Thomas Gresham, 1839. ^ tudorplace.com; accessed 31 July 2016. ^ Mason, 1920, p. 11 ff. ^ Mason, 1920, p. 33 ff. & 43 ff. ^ "Victorian London – Buildings, Monuments and Museums – Royal Exchange". Victorian London (The Dictionary of Victorian London). Retrieved 3 December 2016. ^ Sir Nikolaus Pevsner. The Buildings of England. ^ Philip Ward-Jackson. The Public Sculpture of the City of London 2003. ^ Henry Moore Foundation. "Spiller, John". A Biographical Dictionary of Sculptors in Britain, 1660–1851 2009. ^ Shah, Oliver (10 November 2013). "Square Mile landmark to fetch £80m". The Sunday Times. ^ Waldie, Paul (20 December 2013). "Oxford Properties buys landmark London shopping centre". The Globe and Mail. Walter Thornbury. Old and new London: a narrative of its history, its people, and its places, volume 1 (London : Cassell, Petter, & Galpin, 1873) p. 494 ff. W. H. Pyne. Microcosm of London; or, London in miniature, volume 3 (London Methuen, 1904) p. 17 ff. Mason, A. E. W. The Royal Exchange: a note on the occasion of the bicentenary of the Royal Exchange Assurance (London: Royal Exchange, 1920). Wikimedia Commons has media related to Royal Exchange (London). Royal Exchange, in Cornhill, L. First founded, as also Gresham College in Bishopsgate street, by Sir Thomas Gresham, a rich Merchant. The Royal Exchange is now open to members of the public and free to enter. The current location is exactly as in Pepys' time but this is a later building. It is very impressive from an architectural point of view particularly (in my opinion) the immensely high glass ceiling that covers the whole courtyard. It is now the home of several luxurious shops - which seems apt - but the central court has a place to sit and have a cup of coffee, just as Sam would have done. "Early on in the [16th] century Antwerp had become the great storehouse of Europe, but it was destroyed in 1576 when the people of the Low Countries rose up against the Spanish. "London merchants and financiers took advantage of this to make London the new commercial and financial centre of Europe. The greatest of these was Sir Thomas Gresham (1517/18–79), advisor to Elizabeth I. "Gresham was chiefly responsible for establishing the Royal Exchange in 1565. It soon became a symbol of London's wealth and power." "The Royal Exchange was built at the junction of Cornhill and Threadneedle Street in the City. It was a meeting place for merchants and brokers and became the centre of London's business life. "Space was also provided for over 100 shops within its courtyard. The original building was destroyed in the Great Fire of 1666. "A second Exchange opened in 1669. Much of the property was taken over by Royal Exchange Assurance and Lloyd's of London." SIR THOMAS GRESHAM and the Exchange. In the Royal Exchange of London, however, he raised a more lasting memorial of his wealth and generosity. In 1566, the site on the north side of Cornhill was bought for £3500, and upon it Sir Thomas Gresham built the Exchange. Its materials, as well as its architect, are stated to have been brought from Flanders, and the Burse at Antwerp would seem to have suggested the model. The plan was a quadrangular arcade, with an interior cloister. On the Cornhill front, there was a tower for a bell, which was rung at noon and at six in the evening; and on the north side there was a Corinthian column, which, as well as the tower, was surmounted by a grasshopper the family crest. On the 23rd January 1570, Queen Elizabeth dined at Gresham's house, and visited this new building, which she was pleased to name 'The Royal Exchange.' The shops or stalls in the galleries above the cloister, and surrounding the open court, were, in Gresham's time, occupied by milliners and haberdashers (who sold mouse traps, bird cages, shoe horns, lanterns, and other heterogeneous commodities), armourers, apothecaries, booksellers, goldsmiths, and dealers in glass. The grasshopper of the Royal Exchange is the vane which surmounted the former Exchange. It is of copper-gilt, eleven feet long, and represents the crest of Sir Thomas Gresham, the founder of the first Exchange. But the old civic tradition that this was adopted as an heraldic symbol, from a grasshopper having saved his life when he was a poor famished boy, by attracting a person to the spot where he lay in a helpless condition,--is not supported by fact; since the letters of Sir Thomas Gresham's father, which are in the Paston collection, bear a seal with the grasshopper. This was likewise the sign of Gresham, placed over the door of his banking-house and goldsmith's shop, in Lombard-street: this grass-hopper, which was of large size and gilt, existed entire until the year 1795, when the house, now No. 68, was rebuilt. 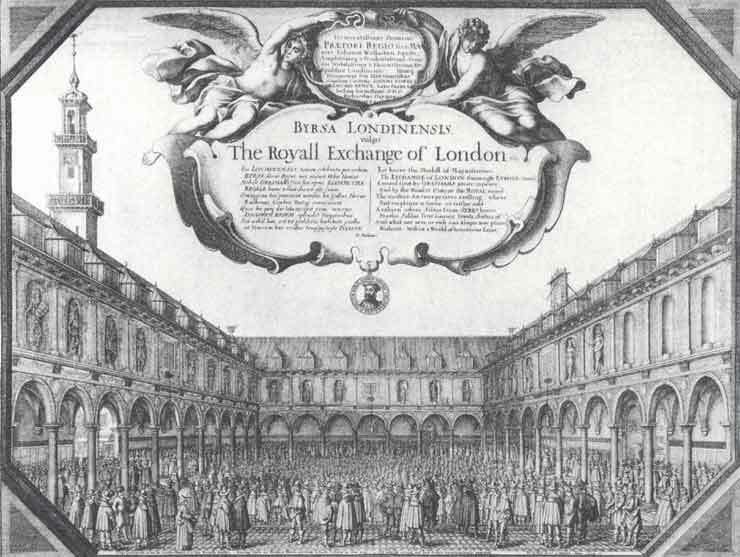 View of the courtyard of Gresham's Royal Exchange enclosed within frame, full of people including two Muscovy merchants in fur caps and a woman ballad seller; three sides of colonnade supporting first floor with niches and statues of English kings; square tower with two balconies and bell turret seen above roofs in the background to left; text by Henry Peacham within cartouche held by two angels above. Byrsa Londinensis, vulgo The Royall Exchange of London (1644). Etching (2nd state of three) by Wenceslaus Hollar (1607–1677), showing an English woman selling broadsheets (in the foreground at left). This view, facing west, of the first Royal Exchange (on the site of the present Exchange at the junction of Threadneedle Street and Cornhill, with Cornhill seen through the south door on the left), is our best visual record of the building which opened in 1569 and was destroyed a century later in the Fire of London in 1666. Verses in the cartouche by Henry Peacham characterize London’s Royal Exchange as superior to the Antwerp Bourse, “where / But emptines is seene or trifles sold.” London’s own “Modell of Magnificence” carries “rare or rich” goods from around the world: “Arabian odors,” “Silkes from Serres,” “Pearles, Sables, fine linnen[,] Jewels” and other luxury items. Of note, Peacham doesn’t here advertise the availability of broadsides, the sale of which Hollar depicts so prominently. The first Royal Exchange was founded by Sir Thomas Gresham; the first stone was laid June 7, 1566, and the building opened by Queen Elizabeth in person, January 23, 1570-1571. The materials for the construction of the Exchange were brought from Flanders, or, as Holinshed has it, Gresham "bargained for the whole mould and substance of his workmanship in Flanders," and a Flemish builder of the name of Henryke was employed. In general design the Exchange was not unlike the Burse at Antwerp —a quadrangle, with a cloister running round the interior of the building, a corridor or "pawn " above, and attics or bedrooms at the top. On the south or Cornhill front was a bell-tower, and on the north a lofty Corinthian column, each surmounted by a grasshopper—the crest of the Greshams. The bell, in Gresham's time, was rung at twelve at noon and at six in the evening. In niches within the quadrangle, and immediately above the cloister or covered walk, stood the statues of our kings and queens, from Edward the Confessor to Queen Elizabeth. James I., Charles I., and Charles II. were afterwards added. Charles I. 's statue was thrown down immediately after his execution, and on the pedestal these words were inscribed in gilt letters, Exit tyrannus Regum ultimas - "The tyrant is gone, the last of the Kings." Hume concludes his History of Charles I. with this little anecdote of City disaffection, which no doubt was in Addison's mind when he made his Tory fox-hunter satisfied that the London merchants had not turned republicans "when he spied the statue of King Charles II. standing up in the middle of the crowd, and most of the Kings in Baker's Chronicle ranged in order over their heads." Gresham's Exchange was destroyed in the Great Fire of 1666. Pepys describes its appearance as "a sad sight, nothing standing there of all the statues or pillars, but Sir Thomas Gresham in the corner."